pitch like the Lilly we saw last season. Lilly went six innings, giving up only four hits and one run. The real test in this game came in the fourth inning. For whatever reason, Lilly has had trouble this season in the fourth inning, but today he overcame that. The Cubs blew a bases loaded no outs oppotunity in the second, when Ronnie Cedeno struck out and Henry Blanco hit into a double play. Then it was the Mets’ turn. In the top of the fourth, Lilly had a no hitter going. He got the first batter, Jose Reyes, to strike out. Then, former Cubs Angel Pagan hit a double to break up the no no. Lily walked the next two batters, David Wright and Carlos Beltran, to load them up with only one out. Lilly kept his composure and was able to get Carlos Delgado and Dameon Easley to pop out, ending the threat. The Cubs offense came roaring back in the bottom of the fourth. After Ramriez flied out to start the inning, Fukudome hit a single to right. Mark DeRosa hit a fly ball for the second out, but Ronnie Cedeno, fresh off the heroics from Monday nights game, hit a double, and Fukudome flew around the bases to score. Is Fukudome not the most fun player to watch? The Mets intentionally walked Henry Blanco to get to the pitcher, Ted Lilly. With runners at first and second and two outs, Lilly hit a soft liner in between the pitcher and first base, and Delgado and pitcher Luis Figueroa thought the other would get it and Lilly was safe, loading the bases. That’s when Reed Johnson singled, scoring Cedeno and Blanco and making it a 3-0 game. Lilly was able to work out of another jam in the sixth. After getting Wright to ground out, Lilly walked Beltran and gave up a single to Delgado. Easley singled to the load the bases with one out. Lou kept his faith in Lilly, and Ted got Brady Clark to ground out for the second out, but Beltra n scored, making it 3-1 with runners at first and second and two outs. Lilly got Raul Casanove to ground out to end the inning. Bob Howry came in to relieve Lilly and worked a quick 1-2-3 inning in the seventh. In the bottom of the inning, Aramis greeted Mets reliever Joe Smith with a single and tKoske followed that up with a double, putting runners at second and third with no outs. DeRosa singled,scoring Ramirez and giving the Cubs a 4-1 lead. The Cubs were able to load the bases, but couldn’t score anymore runs. Then in the bottom of the eighth, it was time for more Ronnie Cedeno heroics. With Jorge Sosa pitching, Felix Pie and Derek Lee hit back to back singles. Aramis flied out, but Fukudome walked to load the bases. It looked like the Cubs would miss another opportunity when DeRosa hit a ball to shortstop Jose Reyes for an easy double play ball to end the inning, but Reyes had a brainfart and threw the ball home for the foce out. 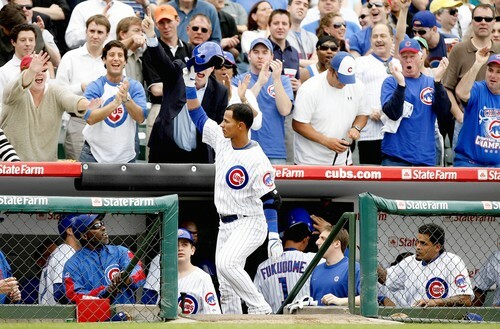 Insteasd of an inning ending double play, Ronnie Cedeno came to the plate and hit a grand slam, giving the Cubs an 8-1 lead, sealing the win for the Cubs. Cedeno had a career high five RBI’s. It’s a good problem to have, but I wonder how Lou manages the lineup. The team has played the last two days without Theriot, and the Cubs have really gotten on a role after the Soriano injury. Since then, Reed Johnson has been incredible leading off and Cendeno look like an entirely different player. Cedeno was 10-for-18 (.556) on the homestand with 10 RBIs, while Johnson was 11-for-28 (.393) with four RBIs. 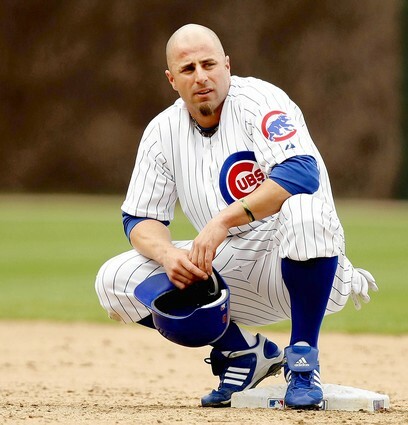 Johnson is the prototypical lead off hitter the Cubs have been looking for since Kenny Lofton in 2003. He works the count, takes pitches, and has had his fair share of cluch hits. He seems to be full of hustle and has a high baseball IQ. The Cubs actually lead the NL in on base percentage. Kosuke Fukudome leads all Cubs regulars with a .442 OBP going into Monday’s game against the Mets, followed by Geovany Soto (.437), Mark DeRosa (.425), Derrek Lee (.419), Reed Johnson (.418) and Ryan Theriot (.408). The Cubs are wearing down pitchers, getting men on base, and now those solo home runs are becoming 2 or 3 run homers. Even grand slams. With all these guys getting on base, they are putting more pressure on the pitchers and getting better pitches to hit. Just to let you know, the last time the Cubs led the league in on base percentage-1945. Now Pinella will have to face a bunch of questions when Soriano gets closer to being off the DL on May 1, one week from Tuesday. 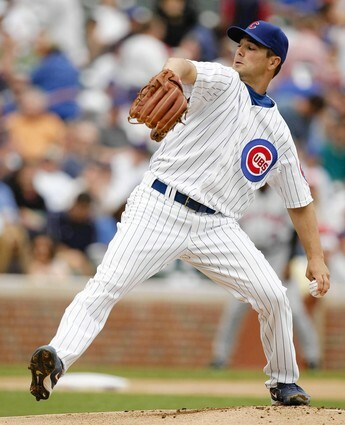 Ryan Theriot, before the back spasms was also doing a great job. So what does Lou do? What would you do? Nice to have these problems and nice to still be in first place. Now the Cubs try to become the second team in MLB history to get 10,000 wins. Let’s go get’ em in Colorado. Rich Hill takes on Franklin Morales in game 1. Wow… I’ve been going over possible lineup scenarios and I’m just not sure what you do. Do you mess with Kosuke and move him to 2 maybe? I don’t know that you want to mess with what’s working. What happens to Pie who seems to have found that “click” his minor league hitting coach talked about the other day? Good point Dy. The cubs have nothing but good problems these days. Do I drink the Cristal or the Dom as I draft today’s lineup card?, mulls Lou. Everyone on that list (on some nights even “Pitcher”) would bat cleanup for the giants right now. Best start of our lives. Everything is going our way. I ‘m sick with Cubs fever and never felt better. Will things go wrong this year? Sometimes. Will someone get injured? Who knows. I do know that if we keep scoring 6 runs a game and our staff, collectively, gets their act together, there is no way we aren’t going to have an interesting october to enjoy. Z is stellar! Dempster may not last (but we have Lieber and Marshall waiting), Lilly and Hill will only get better, Marquis’ pitching with a chip on his shoulder. It’s great to see the light bulb finally go on for Ronny Cedeno!